Liberties are taken in the latest recreation of a Stephen King novel that’s already been turned into film. Co-directors Kevin Kölsch and Dennis Widmyer commit an ultimate sin, trying to write a twist on the original story changing what the horror writing master does best, write about children. There was a brilliance in the death of the Creed family’s youngest son Gage who can barely talk. He doesn’t bring back stories from the afterlife. Words are written in Ellie’s (Jeté Laurence) mouth that King didn’t write. The afterlife is overexposed by the young actress who gives an adequate performance that is still the films worst. 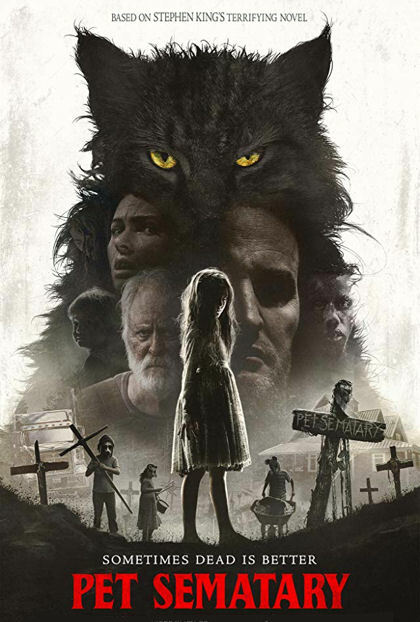 The most recent adaptation of the original Pet Sematary is just as much of a modern day film as the 1989 original was an 80’s movie. CGI effects replace eccentric performances as thier modern day normal. The 1989 film provided some of the scariest scenes in cinematic horror history, while the newest creation succumbs to modern movie pitfalls adding unneeded additions like pet masks and twists in storytelling. If the original story and film had not existed I may not have issues with the truck jackknifing unnecessarily, and an obvious over the top perfect, green screen setting from the tribal burial grounds that just looks movie fake compared to the simplicity of the original set. John Lithgow does an excellent job as Jud Crandle but there is no localization in the big budget studio feature, there’s no Maine accent and he’s not Fred Gwynn. This studio produced Pet Sematary removes The Ramones from the Stephen King tale, replacing them with a cover band. Everything sounds right but the soul of The Ramones and King’s true intentions are second rate. Just like in the movie which had a great opportunity to end on an intimate note with a father, daughter moment but chose to do what they thought was more bleak, I could have ended this review with the Ramones comparison but chose to mention the ending. The heart of the ending is lost by wanting to go deeper where there's just no humanity left.